The Caracas Stock Exchange or Bolsa de Valores de Caracas (BVC) is a stock exchange located in Caracas, Venezuela. Established in 1947, BVC merged with a competitor in 1974. BVC is a private exchange, providing operations for the purchase and authorized sale of securities according to the Capital Marketing Laws of Venezuela. It is member of the Executive Committee of the Latin American Federation of Stock markets. At the exchange, companies emit by procedures authorized by the regulating authorities, instruments of fixed income and securities (renta fija y de renta variable) with the purpose of securing capital from public investors. BVC is also used as a location for trading in Bonds and other debt instruments. The legal structure prevailing in the Venezuelan capital market are the Securities Marketing Law (la Ley de Mercado de Capitales, enacted in 1975 and amended in 1998), Transaction Law (Ley de Caja de Valores), the Statutory Law of Public Credit (Ley Orgánica de Crédito Público), the Law of Organizations of Collective Investment and the norms dictated by the National Exchange Commission (Comisión Nacional de Valores, or CNV). Exchange activities are regulated and supervised by the National Exchange Commission, a public entity assigned to the Ministry of Finance, that authorizes internal procedures and regulations. The Board of Directors of the Caracas Stock Exchange is presided over by Víctor Julio Flores. Additional members include Santiago Fernández Castro, Marcel Apeloig, Omar Delgado, José Gregorio Castro, Gabriel Osío, Jesús Tadeo Prato, Luis Oberto, Carlos Fernández and Mario Dickson, as well as by advisers Luis Andrés Guerrero and Rubén Manzur. The origins of the Venezuelan stock market can be traced to the end of the colonial era, when in 1805 Don Bruno Abasolo and Don Fernando Key Muñoz founded the Casa de Bolsa y Recreación de los Comerciantes y Labradores in Caracas. The exchange was officially founded on January 21, 1947 and inaugurated its first trading session on April 21 of the same year, after previously trading stocks over the counter. On May 6, 1976, the assembly of shareholders decided to change the denomination of the institution to Bolsa de Valores de Caracas C.A., and initiated a new operating structure composed of 43 shareholders, or puestos de bolsa, an amount that would be increased to 63 members in 1995. In April 2007, 60 companies were listed on the BVC, with less than half being traded regularly. BVC experienced a severe decline in traded volumes since the mid-1990s as a result of a declining economy, the migration of stocks to the U.S. markets in the form of American Depositary Receipts (ADRs), corporate takeovers with a concomitant reduction in the number of shares available for trade and an increasing country risk that has frightened investors, particularly foreign investors. Daily trading volume decreased from the equivalent of $25 to $30 million in 1997 to less than $1 million by 2000. The BVC survived during this period thanks to a growing trade of government debt securities. Stock prices, measured by the Indice Bursátil Caracas, were also depressed during the 1990s and have yet to recover to the highest ever levels experienced in 1991. According to the International Finance Corporation, the market value of the BVC was $7 billion in 2000, or just about 6 percent of GDP. In 2005 total transactions on the BVC totaled USD$ 438 million. BVC has been completely electronic since February 1992, when a modern electronic trading system developed by the Vancouver Stock Exchange entered operations. On July 2, 1999 another technological change was made when the SIBE (Sistema Integrado Bursátil Electrónico), electronic trading system was officially incorporated into the Caracas Stock Exchange. ^ "The foresight saga". The Economist. 16 December 1999. Retrieved 22 December 2015. Gran Colombia is a name used today for the state that encompassed much of northern South America and part of southern Central America from 1819 to 1831. It included the territories of present-day Colombia, Ecuador, northern Peru, western Guyana, the first three were the successor states to Gran Colombia at its dissolution. 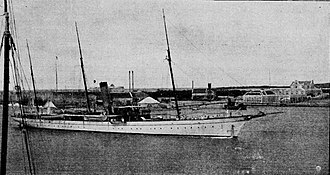 Panama was separated from Colombia in 1903, since Gran Colombias territory corresponded more or less to the original jurisdiction of the former Viceroyalty of New Granada, it claimed the Caribbean coast of Nicaragua, the Mosquito Coast. Its existence was marked by a struggle between those who supported a government with a strong presidency and those who supported a decentralized. The two men had been allies in the war against Spanish rule, but by 1825, their differences had become public and were an important part of the political instability from that year onward, the official name of the country at the time was the Republic of Colombia. The name Colombia comes from the Spanish version of the eighteenth-century New Latin word Columbia and it was the term preferred by the revolutionary Francisco de Miranda as a reference to the New World, especially to all American territories and colonies under Spanish rule. He used an improvised, quasi-Greek adjectival version of the name, Colombeia, to papers and things relating to Colombia. Bolívar and other Spanish American revolutionaries used the word Colombia in the continental sense, the establishment in 1819 of a nation with the name Colombia by the Congress of Angostura gave the term a specific geographic and political reference. The Republic of Colombia comprised more or less the former territories of the Viceroyalty of New Granada and it united the territories of the former Third Republic of Venezuela, the United Provinces of New Granada, the former Royal Audiencia of Panama and the Presidency of Quito. Before a new constitution could be written by the Congress of Cúcuta, under the Constitution of Cúcuta, the country was divided into twelve departments governed by an intendant. Departments were further divided into provinces headed by a governor. Military affairs at the department level were overseen by a commandant general, all three offices were appointed by the central government. They interpret Bolívars ideas from a socialist perspective. Simón Bolívar has left a lasting imprint on the Venezuelas history in particular. Chavez as a cadet was a celebrant of the Bolivarian passion story. Chavismo policies include nationalization, social programs, and opposition to neoliberalism. According to Hugo Chávez, Venezuelan socialism accepts private property, chavismo support participatory democracy and workplace democracy. In January 2007, Chávez proposed to build the state, whose main idea is to build self-government institutions like communal councils, communes. Analysts have pointed out additional anti-American and authoritarian-leaning traits in those governments, the social programs that came into being during the term of Hugo Chávez sought to reduce social disparities and were funded in large part by oil revenues. The sustainability and design of the programs have been both praised and criticized. Specific examples of programs are listed below. Plan Bolívar 2000 was the first of the Bolivarian Missions enacted under of administration of Venezuelan President Hugo Chávez. According to the United States Department of State, Chávez wanted to send the message that the military was not a force of popular repression, but rather a force for development and security. The State Department commented that this happened only 23 days after his inauguration, the plan involved around 40,000 Venezuelan soldiers engaged in door-to-door anti-poverty activities, including mass vaccinations, food distribution in slum areas, and education. Several scandals affected the program as allegations of corruption were formulated against Generals involved in the plan, the mission was to provide comprehensive publicly funded health care, dental care, and sports training to poor and marginalized communities in Venezuela. Barrio Adentro featured the construction of thousands of iconic two-story medical clinics—consultorios or doctor’s offices—as well as staffing with resident certified medical professionals. Barrio Adentro constitutes an attempt to deliver a de facto form of health care, seeking to guarantee access to quality. 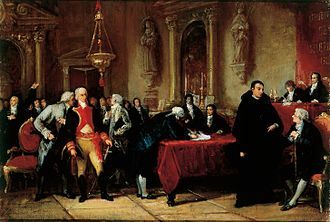 The Viceroyalty of New Granada was the name given on 27 May 1717, to the jurisdiction of the Spanish Empire in northern South America, corresponding to modern Colombia, Ecuador and Venezuela. The territory corresponding to Panama was incorporated in 1739, in addition to these core areas, the territory of the Viceroyalty of New Granada included Guyana, southwestern Suriname, parts of northwestern Brazil, and northern Peru. Sporadic attempts at reform were directed at increasing efficiency and centralizing authority, the rough and diverse geography of northern South America and the limited range of proper roads made travel and communications within the viceroyalty difficult. The Wayuu had never subjugated by the Spanish. The two groups were in a more or less permanent state of war, there had been rebellions in 1701,1727,1741,1757,1761 and 1768. In 1718, Governor Soto de Herrera called them barbarians, horse thieves, worthy of death, without God, without law, of all the Indians in the territory of Colombia, the Wayuu were unique in having learned the use of firearms and horses. In 1769 the Spanish took 22 Wayuus captive, in order to put them to work building the fortifications of Cartagena, the reaction of the Wayuus was unexpected. On 2 May 1769, at El Rincón, near Riohacha, they set their village afire, burning the church, the Spanish immediately dispatched an expedition from El Rincón to capture the Wayuus. 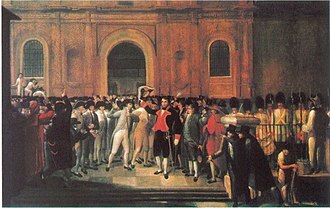 At the head of this force was José Antonio de Sierra, the Guajiros recognized him and forced his party to take refuge in the house of the curate, which they set afire. Sierra and eight of his men were killed and this success was soon known in other Guajiro areas, and more men joined the revolt. According to Messía, at the peak there were 20,000 Wayuus under arms, many had firearms acquired from English and Dutch smugglers, sometimes even from the Spanish. This enabled the rebels to take all the settlements of the region. According to the authorities, more than 100 Spaniards were killed, many cattle were taken by the rebels. The Spaniards took refuge in Riohacha and sent urgent messages to Maracaibo, Santa Marta and Cartagena, the rebels themselves were not unified. Caracas, officially Santiago de León de Caracas, is the capital, the center of the Greater Caracas Area, and the largest city of Venezuela. Caracas is located along the Guaire River in the part of the country. Terrain suitable for building lies between 760 and 910 m above sea level, the valley is close to the Caribbean Sea, separated from the coast by a steep 2, 200-metre-high mountain range, Cerro El Ávila, to the south there are more hills and mountains. Libertador holds many of the government buildings and is the Capital District, the Distrito Capital had a population of 2,013,366 as of 2011, while the Metropolitan District of Caracas was estimated at 3,273,863 as of 2013. The Metropolitan Region of Caracas has an population of 5,243,301. Businesses that are located in the city include service companies, banks and it has a largely service-based economy, apart from some industrial activity in its metropolitan area. The Caracas Stock Exchange and Petróleos de Venezuela are headquartered in Caracas, PDVSA is the largest company in Venezuela. Caracas is Venezuelas cultural capital, with restaurants, museums. Some of the tallest skyscrapers in Latin America are located in Caracas, in 2015, Venezuela and its capital, had the highest per capita murder rates in the world, with 119 homicides per 100,000 inhabitants. Most murders and other violent crimes go unsolved, at the time of the founding of the city in 1567, the valley of Caracas was populated by indigenous peoples. Francisco Fajardo, the son of a Spanish captain and a Guaiqueri cacica, fajardos settlement did not last long. It was destroyed by natives of the led by Terepaima. This was the last rebellion on the part of the natives, on 25 July 1567, Captain Diego de Losada laid the foundations of the city of Santiago de León de Caracas. The foundation −1567 – I take possession of land in the name of God. In 1577 Caracas became the capital of the Spanish Empires Venezuela Province under Governor Juan de Pimentel, during the 17th century, the coast of Venezuela was frequently raided by pirates. The history of Venezuela reflects events in areas of the Americas colonized by Spain starting 1522, amid resistance from indigenous peoples, led by Native caciques, such as Guaicaipuro and Tamanaco. However, in the Andean region of western Venezuela, complex Andean civilization of the Timoto-Cuica people flourished before European contact and it gained full independence as a separate country in 1830. During the 19th century, Venezuela suffered political turmoil and autocracy, since 1958, the country has had a series of democratic governments. This new constitution changed the name of the country to República Bolivariana de Venezuela. Late Pleistocene hunting artifacts, including tips, come from a similar site in northwestern Venezuela known as El Jobo. According to radiocarbon dating, these date from 13,000 to 7000 BC, taima-Taima, yellow Muaco, and El Jobo in Falcón are some of the sites that have yielded archeological material from these times. These groups co-existed with megafauna like megateriums and toxodonts, archaeologists identify a Meso-Indian period from 7000–5000 BC to 1000 AD. In this period and gatherers of megafauna started to turn to food sources. Pre-Columbian Venezuela had an population of one million. In addition to indigenous peoples known today, the population included historic groups such as the Kalina, Auaké, Mariche, the Timoto-Cuica culture was the most complex society in Pre-Columbian Venezuela, with pre-planned permanent villages, surrounded by irrigated, terraced fields. 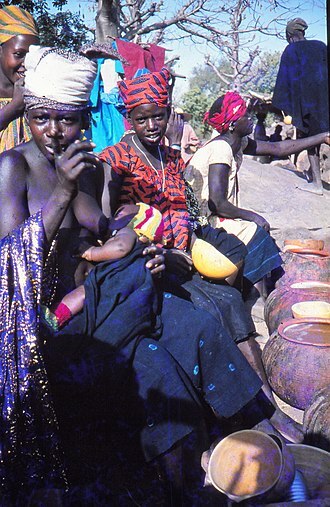 They stored water in tanks and their houses were made primarily of stone and wood with thatched roofs. They were peaceful, for the most part, and depended on growing crops, regional crops included potatoes and ullucos. They left behind works of art, particularly ceramics. They spun vegetable fibers to weave textiles and mats for housing. They are credited with having invented the arepa, a staple of Venezuelan cuisine, beginning around 1000 AD, archaeologists speak of the Neo-Indian period, which ends with the European Conquest and Colony period. In the 16th century, when Spanish colonization began in Venezuelan territory, historians have proposed many reasons for this decline, including exposure to European diseases and the systematic elimination of indigenous tribes for control of resources valued in Europe. Debt is money owed by one party, the borrower or debtor, to a second party, the lender or creditor. The borrower may be a state or country, local government, company. The lender may be a bank, credit card company, payday loan provider, Debt is generally subject to contractual terms regarding the amount and timing of repayments of principal and interest. Loans, bonds and mortgages are all types of debt, the term can be used metaphorically to cover moral obligations and other interactions not based on economic value. For example, in Western cultures, a person who has been helped by a person is sometimes said to owe a debt of gratitude to the second person. Interest is the fee paid by the borrower to the lender, interest is calculated as a percentage of the outstanding principal, which percentage is known as an interest rate, and is generally paid periodically at intervals, such as monthly or semi-annually. Interest rates may be fixed or floating, in floating-rate structures, the rate of interest that the borrower pays during each time period is tied to a benchmark such as LIBOR or, in the case of inflation-indexed bonds, inflation. There are many different conventions for calculating interest, depending on the terms of the debt, compound interest may accumulate at a specific interval. In addition, different day count conventions exist, for example, sometimes each month is considered to have thirty days. The annual percentage rate is a way to calculate and compare interest rates on an annual basis. 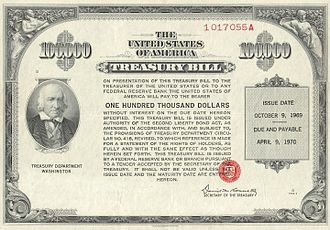 Quoting interest rates using APR is required by regulation for most loans to individuals in the United States, for some loans, the amount actually loaned to the debtor is less than the principal sum to be repaid. This may be because upfront fees or points are charged, or because the loan has been structured to be sharia-compliant, the additional principal due at the end of the term has the same economic effect as a higher interest rate. This is sometimes referred to as a dozen, a play on bakers dozen – owe twelve, receive a loan of eleven. Amortization structures are common in mortgages and credit cards, debtors of every type default on their debt from time to time, with various consequences depending on the terms of the debt and the law governing default in the relevant jurisdiction. 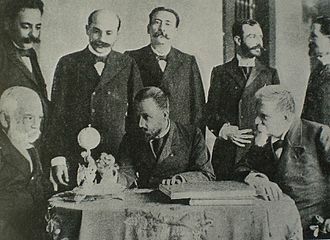 A tribunal convened in Paris in 1898 to decide the matter, and in 1899 awarded the bulk of the disputed territory to British Guiana. Then US President Grover Cleveland adopted an interpretation of the Doctrine that did not just forbid new European colonies. The territorial claims were originally those of the Spanish Empire and of the Dutch Empire, the basis of the discussions between Venezuela and the United Kingdom lay in Britains advocacy of a particular division of the territory deriving from a mid-nineteenth-century survey it commissioned. As a result of this he was commissioned by the British government to carry out a survey of Guianas boundaries, the Line went well beyond the area of British occupation, and gave British Guiana control of the mouth of the Orinoco River. No treaty between Britain and Venezuela was reached, and after an 1850 agreement not to encroach on disputed territory, the matter rested until 1876. Schomburgks initial sketch, which had published in 1840, was the only version of the Schomburgk Line published until 1886. This led to accusations by US President Grover Cleveland that the line had extended in some mysterious way. 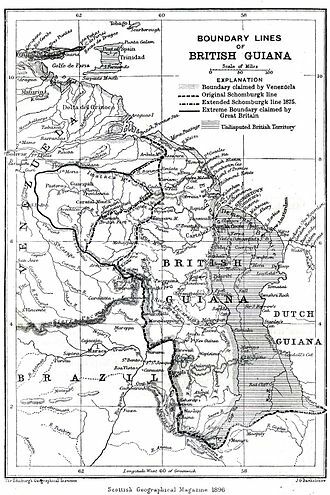 In October 1886 Britain declared the Line to be the frontier of British Guiana. The mine at El Callao, started in 1871, was for a one of the richest in the world. 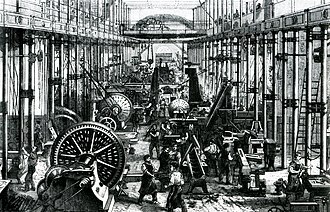 The gold mining was dominated by immigrants from the British Isles, Venezuela had in the course of the dispute repeatedly appealed to the US and to the Monroe Doctrine, but the US had declined to involve itself. This changed after Venezuela obtained the services of William L. Scruggs, Scruggs, a former US Ambassador to Colombia and Venezuela, was recruited in 1893 by the Venezuelan Government to operate on its behalf in Washington D. C. as a lobbyist and legal attache. Scruggs had apparently resigned his ambassadorship to Venezuela in December 1892, as a lobbyist, Scruggs published an October 1894 pamphlet entitled British Aggressions in Venezuela, or the Monroe Doctrine on Trial. In the pamphlet, he attacked British aggression, claiming that Venezuela was anxious to arbitrate over the Venezuela/British Guiana border dispute, Scruggs claimed that British policies in the disputed territory violated the Monroe Doctrine of 1823. Among many other things, the Code of Hammurabi recorded interest-bearing loans. The term bourse is derived from the 13th-century inn named "Huis ter Beurze" (center) in Bruges. From Dutch-speaking cities of the Low Countries, the term 'beurs' spread to other European states where it was corrupted into 'bourse', 'borsa', 'bolsa', 'börse', etc. In England, too, the term ‘bourse’ was used between 1550 and 1775, eventually giving way to the term ‘royal exchange’. 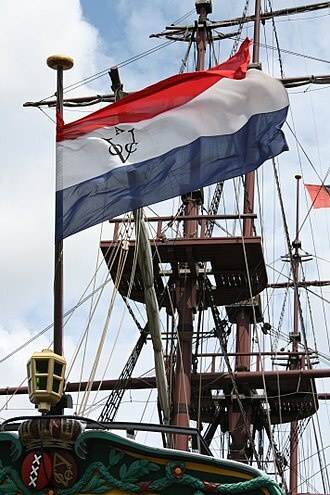 Replica of an East Indiaman of the Dutch East India Company/United East Indies Company (VOC). The Dutch East India Company was the first corporation to be ever actually listed on a stock exchange in its modern sense. In other words, the VOC was the world's first formally listed public company. Cult image sculpted in ceramic, Los Roques Archipelago. Petroglyph in the Waraira Repano National Park. 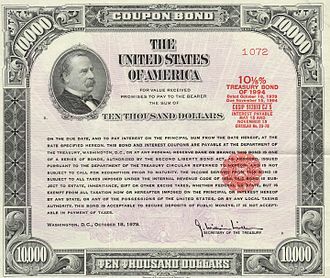 Bond certificate for the state of South Carolina issued in 1873 under the state's Consolidation Act. Railroad obligation of the Moscow-Kiev-Voronezh railroad company, printed in Russian, Dutch and German. Storage room, Palace of Knossos. 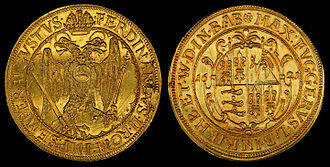 10 Ducats (1621), minted as circulating currency by the Fugger Family. ESET (IT security company) headquarters in Bratislava, Slovakia. An 1896 cartoon from an American newspaper, following Britain's agreement to go to arbitration. Chávez holds up a miniature copy of the 1999 Venezuelan Constitution at the 2005 World Social Forum held in Porto Alegre, Brazil. Chávez waves to supporters after disembarking at Salgado Filho Airport on 26 January 2003 while en route to the World Social Forum convened in Porto Alegre, Brazil (Agência Brasil). A group of Venezuelans eating garbage in May 2018. Protesters sign saying, "Why do I protest? Insecurity, scarcity, injustices, repression, deceit. For my future." Multiple signs of Nicolás Maduro remaining from the 2013 Venezuelan presidential election. Masked Venezuelan motorcyclists are often associated with colectivos. Late President Hugo Chávez in 2010. Home of former general Ángel Vivas. Altamira Square, one of the meeting points of the Mother of All Marches. 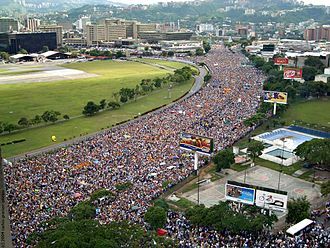 Millions of Venezuelans marching on 20 May during the We Are Millions march. Graffitis expressing anger at the Unity Roundtable on October 5. Agreement approved by the National Assembly to declare the usurpation of the presidency by Nicolás Maduro on 15 January. An OV-10E Bronco similar to ones used by Chávez's rebels. The San Carlos military stockade, where Hugo Chávez was held after attempting a coup-d'état in 1992. Alleged resignation letter of Chávez. View from the Llaguno Overpass down to Baralt Avenue, where the majority of the violence took place. Payday loan businesses lend money to customers, who then owe a debt to the payday loan company. Detail of The Battle of Carabobo (1887) by Martín Tovar y Tovar. Federal Capitol of Venezuela. La Vaca Sagrada, in which Marcos Pérez Jiménez fled to the Dominican Republic. Table where the Puntofijo Pact was signed on 31 October 1958 in Caracas, Venezuela. Héctor Rondón Lovera with his photograph of the rebellion won the 1963 Pulitzer Prize. 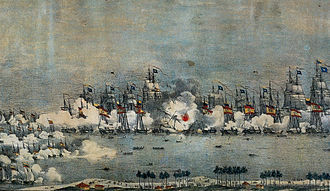 Bombardment of the Solano Castle during the Porteñazo. Long vehicular traffics in gas stations in December 10, 2002. A group of Fortune 500 CEOs in 2015.